Arts Centre Melbourne is inviting movers and shakers of all ages and dance abilities the chance to trip the light fantastic on a state-of-the-art Dance Floor installation created by innovative technologists Eat More Code. 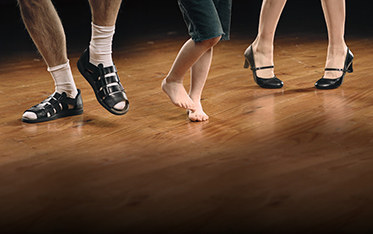 Whether participants are prima ballerinas or have two left feet, Dance Floor is designed to get everyone moving! Dancer’s movements light up the floor and as they leap, twirl and tiptoe across this interactive space a unique sound and light spectacular is triggered. Set up in Arts Centre Melbourne’s Smorgon Family Plaza the free installation is inspired by the joy of play, movement and music and draws on the beauty of ballet and ballet scores. Dance lovers can take a spin on the floor – or step up to the ballet barre and practise their plié! Eat More Code principals Heidi Angove & Justin Hawkins are recognised veteran software engineers and technologists. For Dance Floor they have collaborated with visual artist Sasha Grbich, sound designer Ian Moorhead, lighting designer Chris Petrides and choreographer Ingrid Voorendt. Participants can visit Dance Floor in Smorgon Family Plaza before seeing The Australian Ballet’s Storytime Ballet or stay after the show to try out some moves of their own!